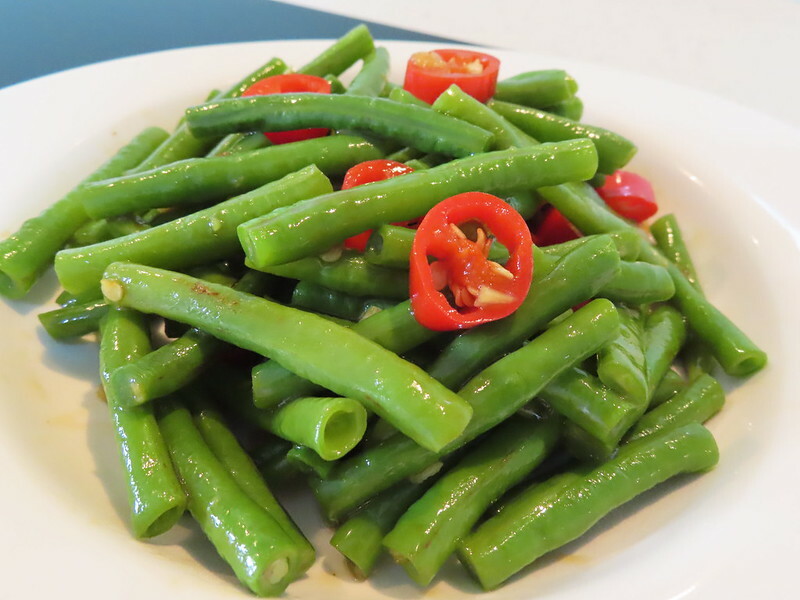 I love green and crunchy long beans. And it’s a very simple dish to cook. Wash long beans clean. Cut into medium strips. Boil a pot of hot water. Add in 1 pinch salt and several drops of oil. Add long beans in and boil for 4 mins to make sure they are completely cooked. Then soak them in cold water and drain them. Heat a pan. Add in 1 tsp oil. When oil is hot, saute chopped 2 or 3 cloves of garlic and 1 red chili till aromatic. Add long beans in. Stir fry for 1 min. Add in 1/2 tsp light soy sauce and 1/2 tsp oyster sauce. Quickly stir fry evenly. You can choose not to add chili if you don’t want it to be spicy at all. This cooking method can also be used to stir fry lady fingers.